Payroll backup and restore works with some payroll software solutions, using data created by these solution to take in a pre-defined payroll backup plan. Handy Backup works as payroll backup software for any solution, and the most convenient way to use it is a “Database” plug-in. Payroll manager backup solutions must have an access to a particular payroll dataset, which the payroll program often keep in some database format. It is true for most payroll software, although some popular solutions such as Moneysoft and MYOB AccountRight, use the non-database files. For non-database format, payroll data backup in Handy Backup operates via either the “Computer” plug-in or the “Network” plug-in, to access local or remote files and folders included in the payroll backup schedule. You can configure a particular payroll backup schedule to backup payroll data within an interval from months to minutes. 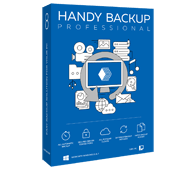 Handy Backup will make all necessary operations automatically and then create a report about each particular task attempt or completion. You can encrypt, compress and time-stamp your payroll backup copies. You can repeat a payroll backup missed when somewhat happened. You can use SFTP or FTPS protocols with SSL transfer encryption to secure data even more. You cannot only lose or compromise your payrolls! You can save your copy of payroll data in the native format provided by your payroll software (which means that you can also copy it or open it manually, too!) 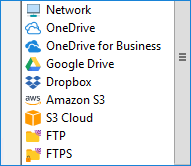 in any place on your local computer, or an FTP server, or a cloud account such as Amazon S3, Google Drive, Dropbox or OneDrive. Feel free to save! The Professional edition contains “Database”, “Computer” and “Network” data source plug-ins, allowing making your payroll automatic backup for any data representation used by your payroll software. Free 30-days trial version! In this section, we will show how to create a task for making payroll automatic backup via the “Database” plug-in for the QuickBooks payroll software application. For payroll manager backup with non-database architecture (such as saving BrightPay files), use the “Computer” plug-in instead. To start creating a QuickBooks payroll backup with the “Database” plug-in, check firstly if an actual ODBC driver available for QuickBooks database. 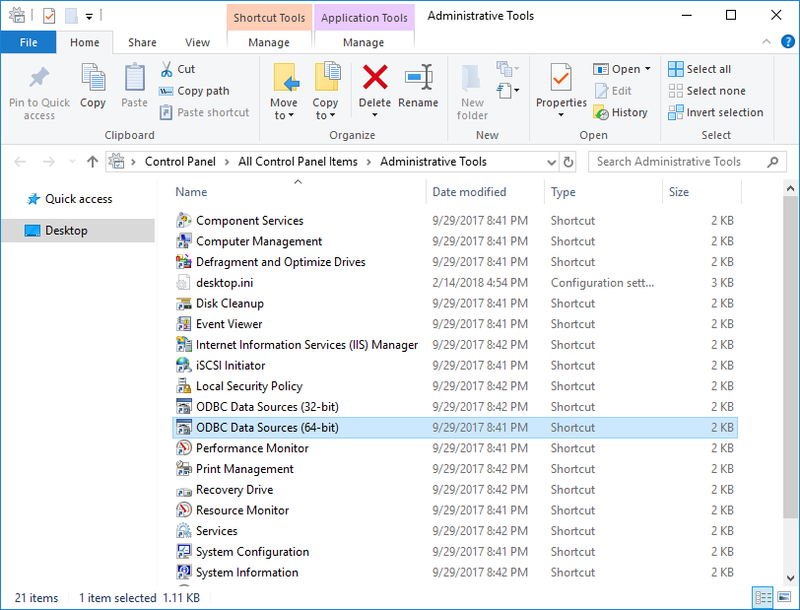 Download and install the current driver, and register it as a Windows data source. These operations are not specific to Handy Backup. 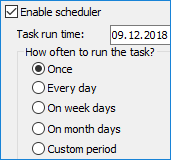 Create a new task. You can use the button on the Management Panel, the menu or Ctrl+N keys. Choose a backup task on the Step 1. 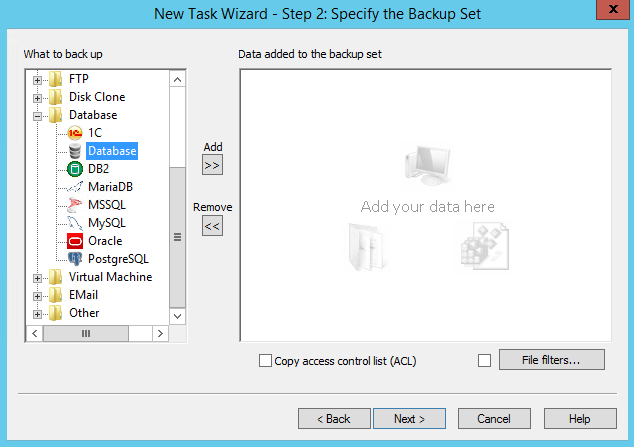 Select the “Database” plug-in from the “Database” group on the Step 2. Click “Add>>”. A new plug-in window will appear. 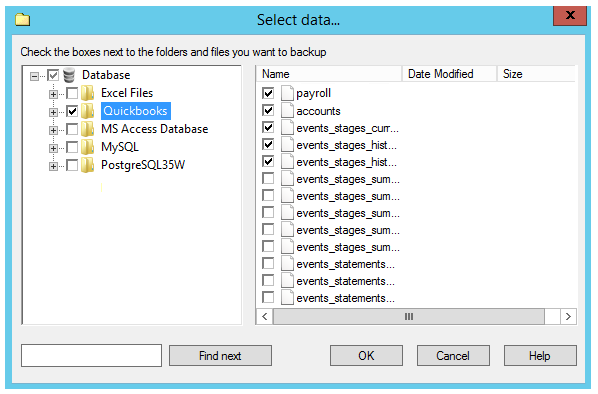 Select the QuickBooks database type. Finally, check the “Payroll” database among the QuickBooks files appearing. Click OK.
Continue creating a task as described in the User Manual. No other steps are specific for creating a payroll backup. Caveat: Always back up databases as databases, not as simple files or folders, to avoid losing current transactions! Handy Backup saves snapshots of files in “hot” mode, ignoring any processes modifying the files during backup, and the “Database” plug-in saves actual transactions, too! 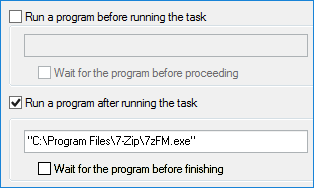 To save payroll files, use either the “Computer” plug-in or the “Network” plug-in on the Step 2. Other steps are the same as for the sequence described before. Make your payroll data backup with Handy Backup, serving as efficient and convenient payroll backup software solution! To try Handy Backup, download the latest version just now, to explain its possibilities and quality for a 30-day free trial!